Mexico's new government plans to legalise recreational cannabis use, as does the incoming government of Luxembourg. Meanwhile, New Zealand's Prime Minister Jacinda Ardern is considering a referendum on what its approach should be. It was only in 2012 that Uruguay announced it would be the first country in the world to legalise recreational cannabis use. In large part, the move was aimed at replacing links between organised crime and the cannabis trade with more accountable state regulation. Later the same year, voters in Washington State and Colorado became the first in the US to support legalisation of the drug for non-medical use. Under President Barack Obama, a critic of the US-led war on drugs, the US government stepped back from enforcing federal laws and effectively gave states a green light to explore alternatives. Eight more states and Washington DC have since supported the legalisation of recreational cannabis and penalties are softening elsewhere. The use of the drug for medical reasons is allowed in 33 of the 50 states. In many ways the jury is still out on the effects of legalisation on society and individuals' health, but there is no question that public opinion and government policy has softened. Does UK export the most legal cannabis? The tide has crept across the Americas, with Canada legalising the sale, possession and recreational use of cannabis nationwide in October. That Mexico will legalise marijuana seems a virtual certainty. The new government of Andrés Manuel López Obrador has introduced a bill that would legalise its medical and recreational use, while the country's supreme court recently ruled an absolute ban on recreational use unconstitutional. Other countries are pushing ahead. Although the sale of cannabis remains illegal, possession of small amounts is no longer a crime in countries including Brazil, Jamaica and Portugal. In Spain it is legal to use cannabis in private, while the drug is sold openly in coffee shops in the Netherlands. Still more countries allow the use of medicinal cannabis. In many countries, the move towards legalisation started with a softening of public attitudes. In the US and Canada, images of sick children being denied potentially life-changing medicines had a tremendous impact on public opinion - a concern that brought forward legalisation for medical purposes. A similar softening of attitudes has been seen in the UK. In June, 12-year-old Billy Caldwell, who has severe epilepsy, was admitted to hospital after his medical cannabis oil was confiscated. A month later, a special licence to use cannabis oil was granted to seven-year-old Alfie Dingley, who has a rare form of epilepsy. Following high-profile campaigns, the UK government changed the law to allow doctors to prescribe cannabis products. As US states such as California found in the 1990s and 2000s, familiarity with medical cannabis can soften attitudes towards recreational use. But in the UK, the Home Office says the recreational use of cannabis will remain banned, although senior figures, including former Conservative leader William Hague, have suggested a rethink. Mexico has also had cases of children being denied medical cannabis, but it has also been motivated by the extraordinary violence of its drugs war. Although marijuana makes up a relatively small share of drug cartel revenues, continuing to ban it is seen as increasingly at odds with reality. Mexican diplomats warned the US it was difficult to enforce the fight against cannabis when the neighbouring American state of California legalised recreational use. 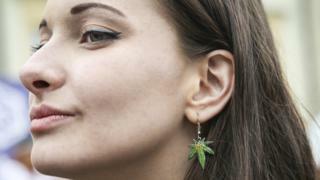 With countries worldwide moving towards some form of legalisation, others are rushing to catch up. Often, as in many parts of Latin America, governments want their farmers to have access to the potentially lucrative medicinal cannabis markets that are developing. Corporations have also expressed interest. For example, Altria, which owns cigarette brands including Marlboro, has made a $1.86bn (£1.46bn) investment in a Canadian cannabis company. Over time, as the US demonstrates, it is quite possible that the medical trade could quite easily morph into recreational sales - potentially opening up an even bigger market. One immediate obstacle is that cannabis for recreational purposes cannot be traded across borders. Countries can only import and export medicinal cannabis under a licensing system supervised by the International Narcotics Control Board. Farmers in countries such as Morocco and Jamaica may have a reputation for producing cannabis, but they can't access markets that domestic producers sometimes struggle to supply - as happened in Canada following legalisation. While there are some rumblings of change within the international legal system, as yet this seems far off. Governments that want to move towards legalisation face a challenge: steering a course between uncontrolled legalisation and hard prohibition. Poorly-regulated industry and mind-altering substances are not a combination about which many societies would feel comfortable. But it seems a virtual certainty that more countries will change their approach to cannabis in the coming decades. As such, domestic and international rules will need to catch up. This analysis piece was commissioned by the BBC from an expert working for an outside organisation. Dr John Collins is the executive director of the International Drugs Policy Unit at the London School of Economics and Political Science.